For fast food / family style restaurants. 2 locations, $1.5million TIV per building, $2million Total Annual Sales and $600,000 Total Annual Payroll. 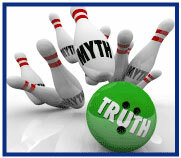 Myth #4: You have to have a good driving record to have an umbrella. MYTH: It's a lot more work to get an umbrella for an elderly driver. TRUTH: Elderly folks are often as easy to quote as any other customer. Considering the size of the "Greatest Generation" (those born 1901-1945, and currently considered elderly) and the "Baby Boomer Generation" (those born 1946-1964, who will be elderly soon enough), wise insurers are recognizing and preparing for the fact that they'll be insuring a significantly increased number of elderly drivers. It's already getting easier for agents. While most umbrella carriers do have additional underwriting guidelines that apply to elderly drivers, they're not so restrictive as to prevent you from obtaining a quote quickly. Similar to youthful drivers, elderly drivers may be required to carry higher underlying limits, or may not be allowed the same number of accidents as someone 20 years younger. Alternately, there may be a charge for elderly driver incidents. However, gone are the days of supplemental medical forms and categorically denying coverage based on age alone…both of which probably seem preposterous to Generation Y agents! It's important to note that there's variation among insurers as to what makes a driver "elderly." With some companies it's being age 80 or older. With others it may be as low as 65 (a little too close for comfort, some baby boomers would argue). If you're quoting someone who's a little older, remember that they may not be considered elderly with every carrier, and so rates and underwriting may vary significantly. Boat owners and the marine community should take proactive measures to minimize the potential for injuries and damage to their boats and other property. Chubb Recreational Marine Insurance® is pleased to offer its list of important tips to help recreational boaters protect their vessels as well as other property on board during the hurricane season. Learn what precautions boaters can take to prepare and safeguard their vessels this season by clicking here. Please feel free to download and review the flyer with your clients. Remember, key factors in protecting your boat from a hurricane or any severe storm are planning, preparation and timely action. 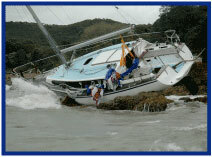 Also critical is having the proper insurance coverage in place, and understanding your policy and duties as a boat owner. Most Chubb policies offer Hurricane Haul-out coverage included at no additional charge. Chubb Recreational Marine has been one of the nation's leading providers of yacht and boat insurance for decades, and we offer an impressive array of policies for a wide range of pleasure craft. We serve the entire spectrum of boat owners - from those with small runabouts and cruisers to the largest mega yachts. The Yachtsman®/Boatsman® Policy provides all-risk protection for both pleasure boats and yachts, including select occasional charter opportunities, along with many unique benefits and features. For more information on Chubb Recreational Marine products, log into Big "I" Markets. Insurer Advertising Spending: 800 Pound Gorilla? One would be hard pressed to make it through a single 30-minute program without seeing a pharmaceutical advertisement on television these days. OK, I'm older than some of you and perhaps the nightly news is a biased sample compared to Game of Thrones, but the idea is of interest as insurers also show up with frequency in advertising. A search of the Internet tells me that estimates are that pharmaceutical companies spent about $5 billion in advertising in 2015. 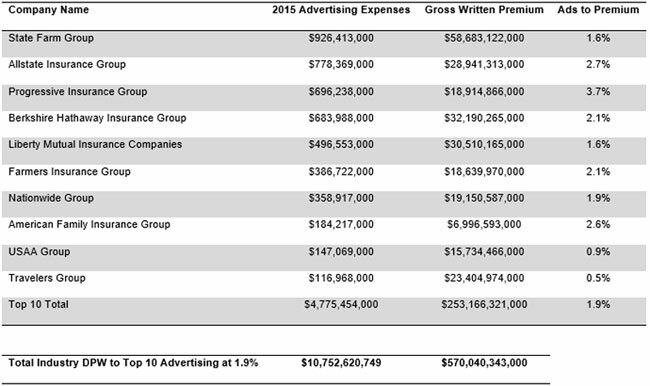 Other searches reveal estimates of total expenditures of all kinds of advertising in 2015 are at about $180 billion. That means pharma represents about 2.75% of total advertising expenditures. As students of the industry you know, "we don't have to estimate." With the property and casualty insurance industry, WE KNOW. Insurers all have to report in their annual "Yellow Books" to regulators how much they spend. Below is the data on the top 10 insurer advertisers by group. Just the top 10 essentially equals pharmaceuticals in spending, so I think that makes insurers an 800-pound gorilla. If you project the average of the Top 10 to the P&C Industry as a whole, the figure is over $10 billion. Obviously smaller and regional insurers do not spend at rates that GEICO or USAA do, but all totaled, it is clear the outsized impact on advertising paid-for entertainment the P&C insurers provide. Congratulations to this week's winners - Ed James (FL), Linda Lyons (NC), Lisa Gammil (MS), Ann Roberts (WA) & Allen Burstein (CT).